Kaifaqu | I said WHAT????? We have had these notices before… “The school is informed by the Electrical Company that there will be a power outage on Friday, May 3 from 7am to 4pm. If you bring your own lunch, please make sure that it does not need heating up as the microwave will not work.” Not to worry, I teach technology, how could having no electricity affect me? I have two teaching areas; one is in the basement with no windows and that is our video/film studio/area, the other is my fishbowl; so anyone strolling the halls sees everything and anyone from the library can wave to my kids as they do. Not to worry, lots of glass plus the windows to outside overlooking just another China construction site with a dozen cranes and lots of people scurrying about to keep us entertained when I have lost the plot. But with no electricity one realizes how dark it still is even surrounded by glass. Computer class was no problem; we just used the new Intel Zen Ultrabooks from the computer carts which had been charged up. They were not able to save to their folders on the intranet but we had a good session with Adobe Fireworks, InDesign and Photoshop and hopefully they will remember what we did by next class. Of course middle school students at the start of spring… maybe not. My basement area was not useable. It reminded me of when photography was more fun when film processing was done in the darkroom. My video area surely is dark enough but I doubt the equipment is even available to develop film anymore. I went to for a semester in 1969 and took courses in photography. It was such a disjointed time in my life; living with Carol Ann and her one year old daughter, Desiree (who now is 45), a friend on Facebook living in Colorado now. Back in 1969 we barely knew the day of the week but I did get to my photography classes. and I somehow got myself a job in a photography studio in Honolulu. I got back into photography and darkroom development toward the end of the 1970s in and used my work as part of my picture poem art which I exhibited in various art shows 1977 – 1979. Part of teaching photography should involve developing film in a darkroom but I doubt that will ever happen again. So we were told that at four pm we would have electricity. Last year this happened too and it did go back on. At four pm the electricity did not come on and when it became too dark to see and there was nothing much to eat and all we have is an electric stove and appliances we asked others, now flushed out into the hall, what their dinner situation was. Folks over at the other apartment complex have gas stoves which lead us to Jean and Sean’s. With candlelight and a gas stove. The electricity did come on for ten minutes and that was it. I made a large pot of spaghetti then Narda and I found our way home in the dark. At about 4 AM the electricity was back on which lacks in excitement when sleep seems to be the only option, however, it was short lived and went off until 7. Looking from our balcony toward our neighbours who obviously had more candles than we did with a the electricity over and out. There were a couple of flickers of off and on but Narda had time to Google+ chat her sons and granddaughter between Australia and Atlanta Georgia. The one in India must have been in between online moments so he did not make it to the ‘hangout’. Five Colour City but we find it run down, seedy, past its whatever-it-was-meant to be heyday, though it is where we buy Western food stuff at Harbour View and purchase stuff for our non-Chinese brains. I read this review of the place recently which sums it up quite well: “There is nothing quite like Five Color City. It’s as if a group of first grade students designed the buildings in crayon for a classroom art project”. [http://www.whatsondalian.com/guide-74-rise-and-fall-of-five-color-city-in-dalian.html]. At the teacher’s get together pot-luck meals tonight – with a day of electricity under our belts the talk was that someone got the wires crossed. OK where did they get their electrician degree from? It was a highly inconvenient stuff-up but as always we enjoyed the moments. I made tofu burger balls, what I usually bring as my contribution and they all got eaten so that is good. I just cooked up a couple cups of black rice, added couple of cups of peanuts, carrots, onions, tofu, spices, flour and deep fried small balls in olive oil. I bring them to each hall party/apartment pot-luck/ and wherever else we end up eating in groups. I used to make them in my tofu factory thirty years ago and took them to barbeques in Australia so my life really does not change in so many ways. Actually we are not the United States of America School – come on mate that is making us into a big target. We are all from many different countries; actually I am from a country called Terrell so surely I am not one to reckon with. Not to be picky but Bondeaux Wine Manor? Really this is not a wine growing area, of course it is another miss-spelt word the signs on the “manor” is “Chateau De Bourdeux” (our video of this development last year which has gone heaps further now) which is just a strange housing sale office. See http://bordeaux-undiscovered.co.uk/blog/2012/09/moving-bordeaux-to-china/ We have done the tour and found it quite enjoyable in a humorous way. This strange structure is across the street from us and they are building 800 homes like it. What is most fascinating is the workers who are from various parts of China and are itinerant workers who find us Western living in their midst quite amusing too. We pass them on our morning walks to the beach and we all have the giggle toward one another. Below is a photo from our balcony. And yes it is not blue burry valley as it says on the sign above. It is Blueberry Valley with a lovely restaurant at the top of the hill where we use to go last year on Friday’s after school. This school year we have not gone there though I am not sure why. The mix of teachers who come and leave changes a lot each year and the previous mix as well as a lot of us first year here teachers clumped together heaps. This school year we all seem to go to place on our own and the social setting is quite different. I found one of my dozens of domains information a few hours ago. I suppose when someone makes a webpage they hope not to be in last place and I guess I am not with billions of webpages out there but as a Leo (Sun, Mercury, Venus and that awful Saturn and Pluto exact conjunction in Leo all in my 10th house – what the hell happend?) I was hoping for a higher ranking than 6,298,119, meaning six million and two hundred ninety eight plus sites are in better position than mine. Maybe it is my colour scheme or lack of sense, a flair for a random artistic flavor that I have always championed going through life. Being popular when there are 7 or 8 billion people is difficult though I think I am ahead of a few billion but I do not know if that is very good. Neuage.org created in 24/04/2003 (what is not noted is that my first neuage.org site was made ten years earlier in 1992 – two years after the WWW was invented and at that time I was ahead of the curve) and owned by Terrell Neuage. Neuage.org takes 6298119th position in global internet… with 159 estimated visits per day. I even have a QR reader on their page leading to my site – try it. We had one of our evening together dinners last night, a celebration of warmer times, at least from a weather perspective. Yesterday was the first time since last October – seven months ago, that we were out and about without jumpers, a tee-shirt day. Today it is 23 (centigrade) so it is bike-riding long-distance time again. I want to go where they are building the new city about half an hour away [Newly Buried Villages of China] . Here is a photo from my balcony looking at where we had dinner last night; I asked about it and the story is that our librarian came across this and others like it in a field went and got the school van and driver and took them to her house. We live near an art school so I would assume it was probably an installation from artists and they probably wonder who stole their art. I use to do art installations – hanging pictures amongst trees as a show and would have been shocked to find them missing. I did a series of clothing that I dipped in plaster of paris and when dried I sprayed painted and wrote poems on them and hung them in a park in the centre of Adelaide and no one took them. I did this once with a dress from a girlfriend and hung in a tree in front of the art school in Adelaide and it lasted a couple of weeks before disappearing. Now that the librarian is leaving she gave these paper machete figures away with this one landing on the porch of our neighbor across the way. I call it ‘caged thievery’. An evening without electricity and candles make any mood just so good. Sunday morning, wanting to write up what is a bit of a big thing in my small world and definitely may bring some closure but of course never full closure as it shouldn’t to my meandering through this life or at least one significant aspect to it but after one paragraph we were off to Long Shan Village which consists really of only a couple of streets with commerce and is a ten minute bike ride away. I first heard of Facebook when I was teaching a speech class at the State University of New York in Albany. Students were presenting speeches about something that was new and interesting in their lives and one student had just been invited to join Facebook which at that time no one else in the class had heard of it. This was about 2005 and so we all became her friends. It seems so long ago when there were only a few college students in Facebook – joining other students in Boston. I still have that account but as I no longer have my university email I do not use it. A year later I made a Facebook page for my son who had decided to leave his life behind; he was a pitcher for the LA Dodgers living in the States when he left the Dodgers in Florida, not telling anyone (they looked all over for him as they were concerned about his mental well-being that week – they said) on August 13th due to a quarrel with his girlfriend who was appearing in the Australian Idol series in Sydney. When Leigh was 16 he was clocked at 91 mph by an Atlanta scout; more scouts followed. He was courted by Atlanta, Minnesota, and Arizona as well as the Dodgers. I wanted him to go to Arizona as I liked their youth program but at 17 he signed with LA and that was it. He arrived in Sydney after the 20 hour trip from Florida (I still have his return ticket) spent a day with his girlfriend and booked the highest floor and went off the 15th story balcony of the Novotel Sydney Olympic Park Hotel. He was facing the baseball stadium where he had practiced with the Australian Olympic team for the upcoming Athens game. I went there for the first eight years after and left flowers where he died but I have not gotten to Sydney the past two years though for the tenth anniversary I plan to go this year. I made a Facebook page for Leigh and a lot of his friends have written over the years, especially on his birthday – he has hundreds of friends. In 1998, Leigh, playing for the Australian U 16 (he was 15) squad in a series in Johannesburg, South Africa, stayed with a family, as all the team did. In his belongings several years ago I found the address of the people he stayed with and wrote them. At some point when I was reading letters people had written in his Facebook Timeline I saw one from a girl who said she knew him from his stay in Johannesburg. I do not go to his page much these past few years but I thought I would check it a few days ago. It is difficult to see his friends living their life, most with children and know he should be there too – and be pitching in the major leagues. He worked so hard at it. When he was ten he use to tell people he would pitch for the New York Yankees one day and of course being the non-baseball country of Australia people would tell him he should play cricket or footy. We use to go out every morning before school and he would do a hundred pitches and again every day after school. Sacha use to join us for years but then he became more interested in basketball, then graffiti then rap and hip hop and now he is the alive and successful one living in Australia and Leigh is just a memory. So back to Facebook; I saw this person from Johannesburg had written in Leigh’s Timeline that she had 6 letters each about nine pages long and if I wanted them I could send an address where to send them to. She had moved to Perth a few years ago and recently had these letters sent to her. Now she will be sending them to my in-laws in Adelaide and I will have them in August. I am so excited about this – to have something that my son wrote in the time before his death. All I have is a very long goodbye letter to his girlfriend and why he was going to leave his life. It is the saddest thing I have ever read. I may find these letters waiting for me just as sad but I hope not. Years ago I even had a lot of Leigh’s Facebook friends playing Farmville with me. It started off with me playing Farmville and not having friends enough to give me gifts and Narda thought it was just silly so I created a bunch of accounts; dead people: Leigh, my brother, my father, mothers (being adopted I had two mothers, both dead, both Farmville friends), a couple of ex-girlfriends (being dead I suppose they are ex), a dog and a series of me (Farmer Terrell, Saint Terrell, Another Instance of Terrell, and etc.). http://neuage.co/LeighFarmvilleMarch2011.html is a short video of my farm ‘growing’. I quit after a couple of years and the past two years I have been too busy or too sane to continue with my farms. A couple of years ago I started an online project on with a professor from Singapore who was teaching in London and was looking at how people deal with death on-line. I lost contact with her in my past move to China and will just continue with my own research and project on dealing with death on-line. Coffee stop in Long Shan Village. We had our storm. Nothing like Sandy visiting the East Coast of the US but the earth had its moments of spitting and farting then the electricity went off. I was doing non-significant stuff at 6:15 am on a Sunday morning; writing up my lesson plans for my broadcast journalism class for the week. Is this nuts or what? Firstly, I should have been sleeping in, or at least playing with my Nikon or sitting on the balcony enjoying a cuppa but no, I was working on my bloody lesson plans. I do enjoy what I am teaching – “Broadcast Journalism” creating in-house twice weekly TV-like shows of announcements and stuff, presented by my class, played in upper school classrooms. This past week we visited the main television station in Dalian; took me a month to get through all the ‘red’-tape to do that one. I made a comment in the main control room of the television station to my students, ‘this is where they would take over if there was a revolution’ and the kids moved away from me, saying; “we have no idea who he is – he is not with us”. But aside of my thinking I was funny it was interesting. A couple of weeks ago we started Skyping with the Canyon School in Bhopal, India and we are working toward creating a documentary in real-time between our classes so that is a bit exciting. Our neighbours, here in Campus Village, at Dalian American International School, let us know there was no electricity, OK, we are old but we knew that. However, we realized there was power in the hall – some backup generator thingy. We moved our coffee pots, blenders and what-nots out to the hall. We often say where we live is like living in an assisted-living establishment. Me being me moved a table to the hall and set my computer back up. Someone said I was addicted to computers, huh? And on I went with my lesson plans – didn’t need the modem, just the laptop which was already low on battery. And no, those are not the ‘girls’ picking up stuff along the shore but locals – of course we are locals, but they are extreme-locals. I assume they are collecting some animals that have burrowed into the storm-washed beach. Glad I am a vegetarian and not one who would eat burrowed sea animals. When they came back the electricity came on – not sure what is with that. And even more strange was that the storm ended. We walked to the main road and hopped the first bus, shelling out our 1 yuan (15 cents) and went to our favourite photo-printing shop. They do such a great job and the price is so cheap – like 5 yuan (80 cents US, 77 cents Australian) for an A3 glossy photo and I am not sure what we paid for a lot of A2 – letter size prints and a dozen 5X7’s but the total bill was 110 yuan ($17.46 US) for a large pile of photos including some 20 pages of Narda’s blog she has been writing with photos and text. The large A3 photo was of my favourite recent photo – Narda in Jackson Square, New Orleans, last July – home for years of my almost youth – I was a street artists there in the early 1970s – in my early 20’s. I took the photo as a black and white so this is not a Photoshoped job. It has a French look to it. We thought we were clever enough to take a bus in front of the art store home. It wound all over the place through Jinshitan, past the light rail stop and we figured it would come back to our area but it ended up back at the art store. In our simple senior citizen type of way we thought it was funny. Nevertheless we got our sorry assess back home without much more effort. Yesterday was a simpler day, we went into Dalian on the school’s shopping bus, got our month’s supply of crap from Metro, put our suitcase full of crap back onto the bus and took the light rail to Kaifaqu where as usual we spent way too much at the local western goods shop, Harbor Deli, buying over inflated-priced cheese and peanut butter, caught the shopping bus back home from Kaifaqu and booked the rest of our trip for winter holidays. We are spending the five-weeks in Viet Nam. We booked the Green Mango Hotel in Hanoi for a few days; we saw it last time in Hanoi but stayed elsewhere, then we are off to HoiAn for a week, one of those great places to be in the world. Then back to Hanoi for Christmas and a few days after. We have a week after we have not planned; leaving it open; maybe to go to Laos or Myanmar – where we still want to live and teach. Last week was Halloween; something we have managed to escape from for more than a decade but this year the owner of our school asked Narda to judge – probably knowing we were escape artists – we surely hid last year, and for me to take photos. I didn’t mind, but Narda just does not take to this holiday. It is not Australian or Dutch – she sees it as just children begging for lollies. And I am ending this rather mundane week with what we see many times outside our window – fireworks. I use to like them heaps, and even bought a box when my son, Sacha, came to visit, but it seems a lot of money that goes quickly. For Sacha’s visit I got a box of 36 rockets – which of course was well worth it – I was so happy to have him here – up from Melbourne – but still as often as they set them off – how they afford it? One last little complaint about my un-interesting life and even less interesting blogs; the storm, Sandy, which left so many without electricity and Internet wiped out half of my reading audience of my blogs. I was having 8 – 10 hits each time I posted a blog then last week’s on neuage.me – https://neuage.me/2012/10/28/rambling-weekends/ I only had three hits. So without sounding pathetic that is it for this week. Just read recently about people getting hundreds of thousands of hits a day for their blogs – I average 8 – 10 a week. Go Neuage!! Morning walks before school are what creates our day in many ways. We have been doing morning walks before school for years; ever since living and working in New York City. We tried to walk every morning from the World Trade Centre subway stop to Narda’s school in the west Village, St. Luke’s. I was a bit unemployed for a couple of years though it was more of a study period so I could get my teaching degree to supplement my PhD to work overseas. In NYC I could teach in private schools but it was time to be more international and what’s another degree when one is already in their 60’s? The NYC walk would take about half an hour and I would go on to the gym and workout for an hour and a half to keep the rust off the bones and keep the old body going for another couple of years. The walk along the Hudson was one of my favourite walks in the world, and we would walk whether it was hot or snowing and cold – always the best times. We continued with our morning walks before school here in Jinshitan as soon as we got to Dalian American International School. Only a few times, when the weather was dreadfully cold, we didn’t walk. Our walks were always to the beach, Golden Pebble Beach, a 20 minute walk each way. This year since we have been back, a month now, we have been riding bikes in the morning. We still spend about 45 minutes, but we get to see more, going further and exploring areas we normally did not get to when we walked. Yesterday we decided not to bike but walk and instead of going on the road we went bush – well that is what they would say in Australia, away from the rapidly built up area across from us and the school. A couple of years ago this whole area was country but now it is being built up at a rapid rate. Our school is about five years old and teachers who have been here for a while said there were pigs roaming around and living here seemed quite out in the middle of nowhere. We have drivers here that take us to the light rail, into town or wherever we need to go. Jack, our main driver – we call all the drivers Jack, because they all are his mates; when we need to go somewhere, whether to the airport or shopping, we call Jack and someone shows up within ten-minutes. When we get the real Jack we joke with him that he is the real Jack, though I doubt he understands anything we say. None of them speak English but they know where we want to go because we go to so few places; airport, light rail, Kaifaqu ,Dalian… What I was going to say and got into a bit of an off spin was that Jack grew up here – really here. He lived where the school’s football/soccer oval now is. Before I upload some photos from our walk I want to see if I get blocked for writing something. I have noticed that in Facebook, which we have to use a VPN for which should make us out to be in another country, that if I say some things not only does Facebook stop but I get knocked off line for a period of time and what I wrote does not show up. For example, I wrote about a certain group which is banned for their meditative ways and bang I was knocked off as soon as I put the name of the group in. I was telling how our local ex-mayor’s wife was being charged with the murder of a Brit and it was linked with how bodies were obtained for the shows that are so popular in the States showing bodies. They are prepared and done here in our local city of Kaifaqu, a burb of Dalian. The bodies are those of the practitioners of so and so group which I am not saying as I want to post this and not have it blocked. The other thing I said recently in Facebook was just mentioning how our school was closed due to an approaching typhoon – that the government suggested all schools in our province be closed because the storm was the largest in fifty-years, and I wrote; “who am I to go against the Chinese Government?” and those must have been some keywords that blocked me. The storm changed course enough to go over to the right and hit the Koreas and I had put that the North one got primarily hit but when I put the words Korea and North together I was blocked again. So we are seemingly allowed to use a VPN though locals I have heard can get into strife using one because it is supposed to be tunneling through the Great Firewall of China which is illegal but we really are watched all the time. And of course there was the fight between Google and our host and I can only get onto my gmail when I am on my VPN – as service we pay for. A few people have had their VPN shut down – the provider, but so far ours, which I am not saying which one, is going well. I think the strife between Google and here is that they refused to not say stuff about the square in Beijing and what happened there. It is the same with all the guards we have around the place where we live. Are they guarding us from some outside threat or are we being watched and kept track of? We go outside of our compound all the time and there are no threats but our housing and school is surrounded by a large fence with guards at the gates and even guards inside the gate in the lobby of our apartment building and at the entrance to our school. the strange looking ship in the background on the left is in the middle of the highway leading to the Golden Pebble Beach resort area. Directly in the back is the new million dollar houses that are suppose to look French – we don’t like them, and to the right is our home and school. Our maids are so good, very friendly, a couple of them are trying to teach us some Chinese words, Narda is doing much better than me, but we are hopeless. Every morning they have a bit of a talking to. There is a person standing in front of them and they all say a few things back and forth in unison. We have no idea what they say. They line up by size , I got this photo on the way to the lift before our morning walk – this would be about 6 AM on the third floor. On the second floor the guards line up, by size too. What I like most about this photo is the guy peeing in the background. A common site in China. Why go looking for a toilet when there is the whole out doors? They use these sort of hand made brooms to sweep the roads in all weather. In the winter they sweep the snow off the roads with them – not that we get much snow. Last winter we had two days each with about an inch of snow. The locals are so friendly. This man was along our walk in the countryside. It really is country where we live but in a few years it will all be built up so we enjoy bush walking whilst we can. This was the first photo we saw of Dalian American International School on the Internet and we love walking past it in the morning and thinking back to not much more than a year ago when we were jumping up and down in our hotel room in Shanghai, after our interview, because we were offered a contract to teach at this school. We were so excited. That was January First 2011, we were returning to the States after Christmas break in Australia. We were living in NYC and Narda was at St Luke’s and I was wondering if anyone would hire someone approach 65 years old. By June 2011 all our belongings were on a ship headed to Dalian and by August 2011 we were teaching here – just a bit over a year ago. Now we feel like locals. And yes it is possible to have a good job and be 65. (from http://www.chinatouristmaps.com/travel/liaoning/dalian/dalian-transportations.html) Discoveryland is not shown but it is a bit off this map or a ten-minute bike ride away – the Chinese tacky version of Disneyland. We either walk (20 minutes) or ride our bikes (7 minutes) to the beach before school each morning except when it is too cold to ride then we rug-up and walk. Today, Sunday, we were going to take the light rail into Dalian but it rained all day and we didn’t get out of the house until almost 10 AM. We took the school’s shopping bus into Kaifaqu, did some shopping and took the light rail home. Not much of an eventful day except it is so good to be home. The States and Australia were great and catching up with family is the best but being back here is tops. We really are not ready to settle in the west. I loved the fact I could turn 65 a couple of days ago and be happily teaching and exploring. That teachers are swept in the dustbin in so many countries is awful. My last school in New York City retrenched us over 55 year olds – eight of us, and hired 20 plus year-old teachers. The school was closed down the next year as one of the worst in NYC – Ross Global Academy. We are reminded of the constancies of life – when I got into the taxi from the light rail to home I tried to put on my seat belt and the driver waved his hand saying no. Wow, we got a $300 ticket a couple of years ago because Narda had taken off her seat belt for just a moment in a small town in Australia. And I was happy to get soy milk and tofu from my favourite tofu shop in Kaifaqu so all in all it was a great first day back in town shopping even in the rain. We have moved apartments and the one we have now has great views of the Yellow Sea with a stretch of three balconies to walk out onto from the bedroom, lounge and office. See photo below – a rainy day but off in the distance is the sea. In front is the incredibly tacky new housing development going up across the street from us. And this is another view slightly to the right showing the hills view with the guard stations and entrance to Campus Village. And this is looking down the row of housing known as Campus Village. The blue roofs at the end are the swimming pool and gym of our school. And here is the actual road distance from where we live (A) to where we are going (B) – see we are surrounded by seas. I was going to write a blog at least once a week; perhaps daily. It was a fine goal, right up there with I was going to work on one of my novels, poems, paintings or children stories a little bit every day, especially the ones I started back in the 1970s, then the one I did in the 1980s and surely I would add to the finished ones of the 1990s and my favourite, “Leaving Australia” that was completed five years ago. That one, all 550 pages, I printed and bound two copies of; one for my son in Melbourne and one for me. When Sacha came to visit a month ago I asked him if he had read the one I gave him four years ago and he said he was going to read it on his trip to Dalian but it was too heavy to carry with his other stuff; something about traveling lightly. Good golly. But surely a blog, added to if not daily at least weekly would be easy. Then as usual life got in the way and I just noticed I had not written anything since Chinese New Years almost four months ago. I have put up many youtube videos in that time from our wanders in Thailand, and various places in China but to write…. It is school – I work so much on lesson plans and projects that I never write anything for myself. So I will just jot down notes about yesterday as it was a bit of a typical this-is-China day. It started way to early, Saturday the 19th of May. I was awake at 3 AM, worried about something; our renters moving out of one of our houses – the one in NYC, or was it my Flash class that my overly-driven Korean students are determined to get a perfect score and the more challenging I make the content even getting them to learn ActionScript coding, the more determined they are to outdo me, or was it that I got an email about re-roofing our house in upstate NY; the Victorian house with a slate roof – not cheap, or our upcoming little trip: to Beijing and getting to Atlanta a week after Narda as I have to stay back and do some IT stuff @ school then taking a driving holiday around the deep south and going to New Orleans for a week – my old stomping grounds in the late 1960s and early 1970s when I was a street artist in Jackson Square, then back to Beijing and on to Australia for July and then back to work here in Dalian – though I was not worried about the road-trip but that we may have to fly to New York because of having to deal with renters or roofs or some other fun-not stuff. I was worried that I was getting more grey hair – though people tell me that at a few months nearer to 65 than I wish to be, the fact I have little grey hair now is a fact to celebrate and not moan about having a few grey hairs is not what I want to see. I look in the mirror and say who is that old fart? A couple of our teachers were celebrating their 40 anniversary together and wanted to have a shared celebration at Discoveryland. Discoveryland is a Disneyland Chinese copy. It is also a ten-minute bike ride away. We live rather remotely but not far away is the national resorts of Golden Pebble Beach (our morning walks before school) and forested areas and the big tourist thingy of Discoveryland. We had never been inside, because the idea of being in a place like that was quite repulsive. So we ride over, tie up our bikes, pay the 170 RMB (about $25 US) to go in and though it is supposed to be the largest adventure park in China and one of the largest in Asia it was the most budget thing I had seen. It is not Disneyland – though in some fake Chinese manner it is quite similar. The food places were all Chinese and quite bad. I managed to get a vegetarian meal but Narda took one bite of her alleged meat ball and could not eat any more. We noticed someone had thrown up at the next table and a crew came in to clean up but it pretty much summed up the place. I found it interesting that inside their large medieval castle there was a cathedral and the cathedral was actually the start of the ghost-house tour and there were bats flying around the stained glass windows. I suppose it is the Chinese concept of religion as superstition and they wanted to be clear about it. We did not want to go on any rides though some of the teachers we went with got in line for the roller-coaster and two hours later they were still in the same line. We walked around, Narda bought a dress – always the way to make a great day better and we hopped on our bikes and headed home leaving the rest of the people we went in with to enjoy Discoveryland without us. The downside? Yes, I get to go there next week with our whole upper school, a kind of end-of-year event. How exciting. Maybe I will take my camera – this was the first time I had not taken videos or stills in years which tells even more how much I enjoyed myself. So I am buggered and decide to take a nap at 3. 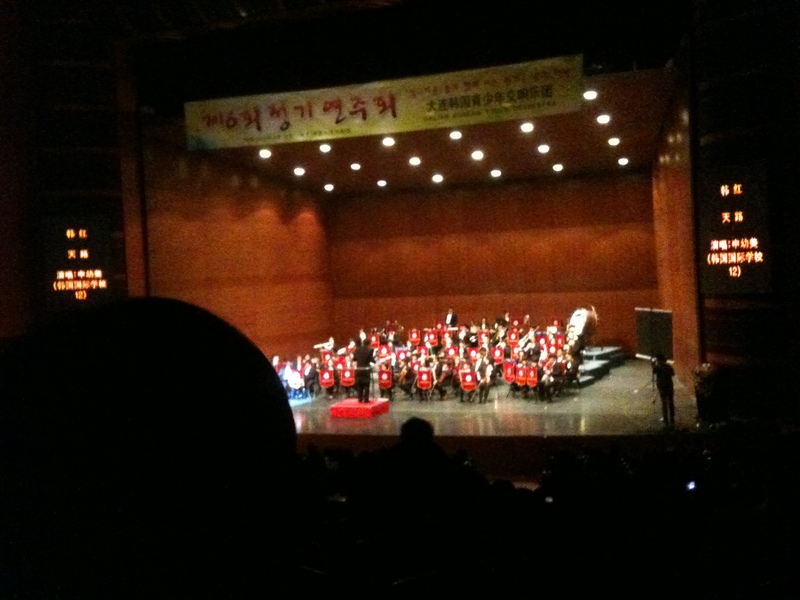 Narda was a bit concerned as she was given a couple of tickets to the “Dalian Korean Youth Orchestra’ concert. As some of her students were in the group parents had given her tickets to attend this ‘special event’. Luckily, she was going with another person and I was going to be left to take a nap. At 3.15 the friend said she was ill and could not go. At 3.20 Narda rang our driver and said to cancel the car to Kaifaqu and everything seemed great. At 3.40 the driver rang and said he was downstairs waiting – we have had no communication problems in the past but Narda was sure that the driver understood ‘cancel’ ‘no car’ no no no. Narda doesn’t want to go alone and then I am up and dressed in five minutes and we are hurdling toward our concert at 3.45 that is to start at 4 and Kaifaqu is half an hour away except for the way most people drive they manage to cut the time down heaps. It only took us 20 minutes. We have learned not to look out the front window because it is too scary the way people weave and cut and beep horns and rarely use blinkers. One thing Narda noticed at a traffic light was a person laying on the grassy part between streets. He wasn’t moving and there were a couple of cars stopped but no one was looking after him. We realized he was dead. In China if someone causes an accident and injures someone it is up to the accident causing person to look after the injured for the rest of their life. It is better if the person dies as they only have to do the funeral. Also, and we saw this our first week here with a person who fell or was knocked off his motorbike and lay dead in the road and was still there hours later, it is up to the family to come and collect the person. Bottom line, don’t get killed in China. So we got into the concert fifteen minutes late but no one had started – like most things we see in China, this was quite chaotic and we just sat in the first empty seats we found instead of finding our actual seats which seemed to cause confusion around us. In China we have noticed, people talk all the time no matter the setting and as someone up front was introducing or saying something everyone around us just kept chatting like there was no one on the stage. The thing started at 4.35 and got off to a bit of a shaky start. At one point a child behind me, being restless and as bored as us, started kicking the seat in front of him, which was mine. I turned around and said ‘will you stop kicking my chair it is very annoying’ in nice clear English without realizing that these people probably had no idea what the words were but the content was obvious as the mother hit the kid and yelled a whole stream of foreign words at him. He didn’t kick my seat anymore. We managed to slip out at intermission and decided to attend a movie, something we had not done in China. At the Cinema we found that the new movie (we think it is new) “Avengers” was playing. As we have gotten adapt with pointing and head nodding and shaking we saw it was in English and it was 3-D and we got free popcorn and soda all for 55 RMB (about $9) and it was starting right then and there. The theatre and large screen were better than what we had seen in NYC and the seats were large and comfortable. The last time we had been to a movie in Asia was in India and we walked out after half an hour because the movie was so stupid and violent. We got a taxi home – I carry my business card with me that has our home in Chinese so we get around easily, and that was our day. Last weekend we spent the weekend, two-nights, at the 5-star Kempinski Hotel in downtown Dalian overlooking Labor Park http://dalian.neuage.us/LaborPark.html. And previous to that we have been to Thailand for spring break and Beijing and just exploring here on the weekends. Maybe the next blog will be from a one-star motel in Alabama as we go off to see the real-America.